Do you have a favorite rant? Ever gone to a meetup where the speaker has the same rant but has discovered a way to introduce it in a calm and thoughtful manner that is awesome? Audrey sees the napkin phenomenon as a perfect opportunity to jump to empathy and focus on understanding what’s behind the expression of the solution on the napkin. Only then can we participate in and/or guide the process. No irritable sulking allowed. I’m a big supporter of Audrey’s message and I hope designers everywhere get on board with it. The meetup was hosted at Runway…one of the best meetup spaces in SF. Thanks, Runway! 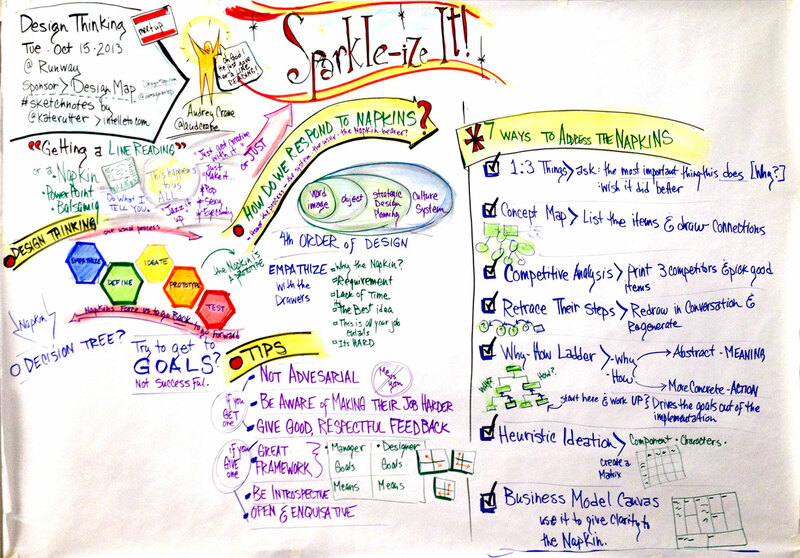 Sketchnotes for Design Thinking Meetup on Sparkle-ize It by Audrey Crane. Want to know more about Design Thinking? Stay tuned for the next Design Thinking Meetup!